Your wedding is one of the most important days of your life. It takes months of planning and preparing. Everything has to be just right! Nothing more so than the wedding cake itself. You can trust Wildewood Pastry Shop to make your ideal wedding cake a reality. 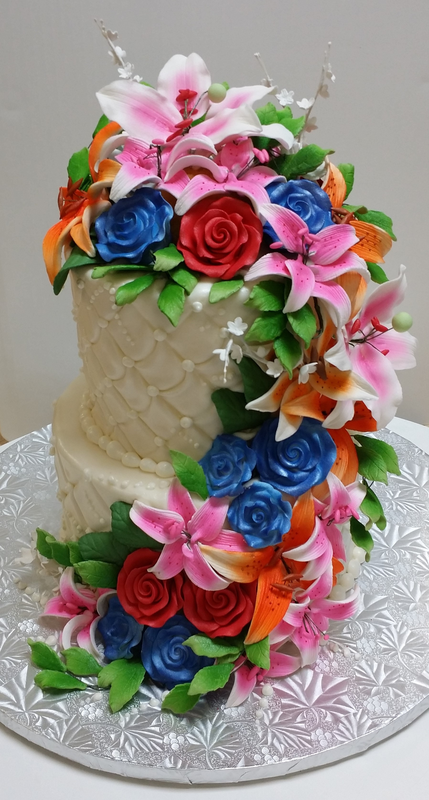 Our pastry chef, Peter Schmitter, is renowned for his skill in cake decoration, and boasts 35 years of experience in the field, with top honors throughout. At Wildewood Pastry Shop, we're dedicated to making your wedding cake one to remember for years. We work with you, based on your input and ideas, to create exactly the right cake for your wedding. And because we pride ourselves on creating fully edible works of art, you'll find our wedding cakes to be just as delicious as they are beautiful. If you'd like to see some examples of wedding cakes we've done in the past, take a look at our Flicker page! 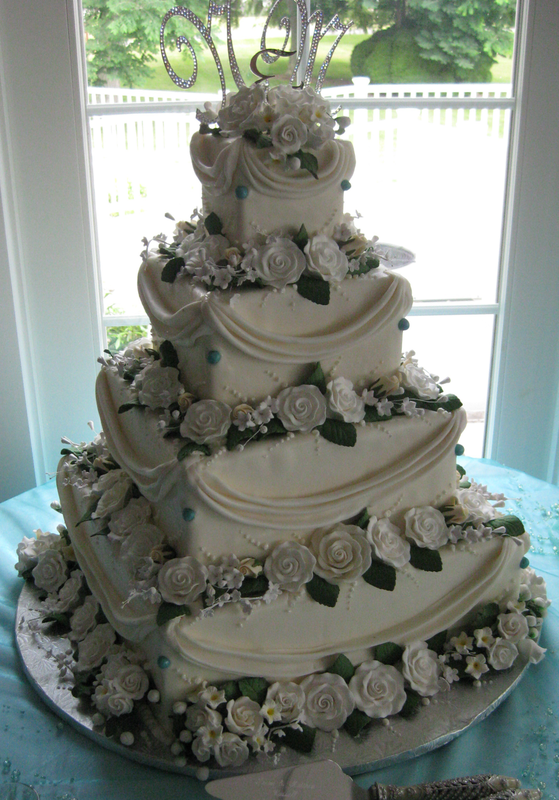 To begin the process of ordering a wedding cake, you can drop by the shop, give us a call, or send us an email. In order to receive an accurate quote, be sure to have important details ready, such as wedding date and venue, serving estimate, and desired flavors. If you have a specific design in mind, be sure to have the image on-hand, or send it to us via email! For cake tastings, visit us at the shop or give us a call to schedule an appointment. Cake tastings are typically scheduled for Saturdays. Please have a selection of desired flavors in mind, as these choices are made upon reservation of your appointment. If you are planning on ordering during your appointment, please provide decoration reference and other relevant details in advance. 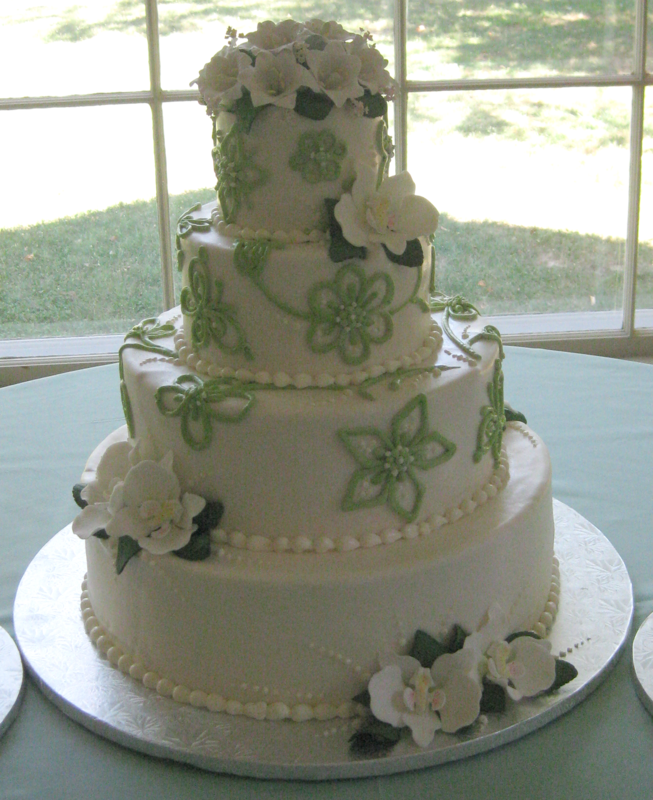 Please keep in mind that wedding cake inquiries may not receive an immediate quote for decoration cost. However, base cake and delivery prices are readily available upon reqest. While details can be worked out over the phone or via email, all wedding orders must be placed in person. Wedding orders require a minimum deposit of 30% at time of order, as well as signature of our wedding contract. Wedding orders should ideally be finalized and placed two weeks to a month in advance. Delivery options are available for Saturdays only, and vary by distance. Delivery for a specific date cannot be guaranteed until your wedding order is placed. To find out if your wedding date is currently open for delivery, please call us at the shop! Wedding contract terms can be reviewed below. Your initial deposit of 30% reserves your event date and is non-refundable. Delivery and setup is usually done 1 to 2 hours before the reception starts. If fresh flowers are provided by an outside source, that source will be responsible for the flower setup. You acknowledge that fresh flowers are not a food product, and may contain pesticides, insects, dirt, or other contaminants. If you or your representatives elect to pick up and set up the cake, you assume all liability and responsibility for the condition of the cake once it leaves the Wildewood Pastry Shop’s possession. Most of our cakes are either too large or irregularly shaped to fit in a cake box so you need to take special care to protect them. Performance of this agreement is contingent upon the ability of Wildewood Pasty shop, Inc. to complete the agreement and is subject to labor disputes or strikes, accidents, Acts of God, and other causes beyond our control.